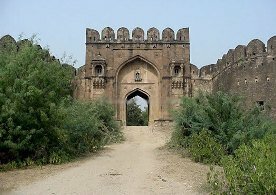 Rohtas Fort was built by the conqueror Sher Shah Suri in 1541, which drove the father of Akbar the great out of India and built this fort to prevent his return. The fort is several miles round and the wall is 30 to 40t thick. This fort is now nearly in ruins but still very much worth visiting. Rohtas Fort is a fascinating spot where we enjoy a picnic lunch and imagine days of old.